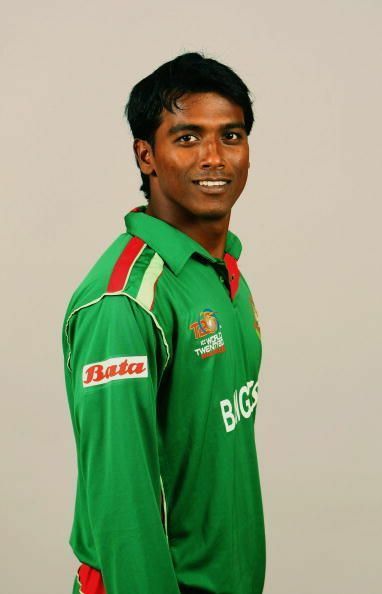 Mohammad Rubel Hossain is a Bangladeshi bowler who was born on 1 January 1990 in Khulna, Bangladesh. He is regarded as the fastest bowler in Bangladesh cricket history. Hossain is hailed as Bangladesh's Malinga because of his slight sling action. He is a right-handed batsman and a right arm fast bowler. For someone who began playing cricket with taped tennis bowl in his hometown Bagerhat, Hossain's rise in international cricket has been pretty impressive. Rubel was famous in his locality for the pacy balls he used to aim at the batsman in tennis ball cricket. He topped the speed charts in a pace hunt program where he impressed everyone with his consistent pace and bounce. He made his first-class debut for Chittagong Division in 2007 against Khulna Division picking up a solitary wicket in the first match. After performing consistently in the National Cricket League, he was selected in the Under-19 team and represented the country at the 2004 ICC Under-19 World Cup. He picked up six wickets in five matches at 21.66 in the tournament. He was then included in Bangladesh A team. The ability to bowl with pace consistently is said to be behind his emergence to the international arena. Rubel made his international debut for Bangladesh in an ODI match against Sri Lanka at Dhaka in January 2009. Sri Lankan batsmen were taken aback by the debutant as he rattled through their middle order and took four wickets in a short spell of 5.3, overs while giving away 33 runs. Sri Lanka was all-out for 147 and Bangladesh won a crucial match by five wickets. He made his test debut against West Indies at Kingstown in July 2011 and picked up three wickets in the match. Rubel's consistent pace was praised by many as Bangladesh really had a fast bowler who could make batsmen duck under the bouncers in fear. After making impressive debut across all formats, he had to find consistency in his performances. He took his maiden fifer in a test match against New Zealand at Hamilton in February 2010. He then took a four-wicket haul against the same opponent at Dhaka in October 2010. The moment of prominence came for him when he took a hat-trick against New Zealand at Mirpur, becoming only the third Bangladeshi bowler to take a hat-trick in ODIs. He ended up with figures of 6/26 in 5.5 overs. Rubel has featured in 25 test matches and has taken 33 wickets. Whereas, in 82 ODIs he has taken 102 wickets at 34.22. In 16 T20Is he has taken 15 wickets.